ABOUT TCB PROJECT Our goal: To ensure sustainability of the Teaching Computer Basics Project, that has impacted thousands and still counting, lives in rural Ghana. 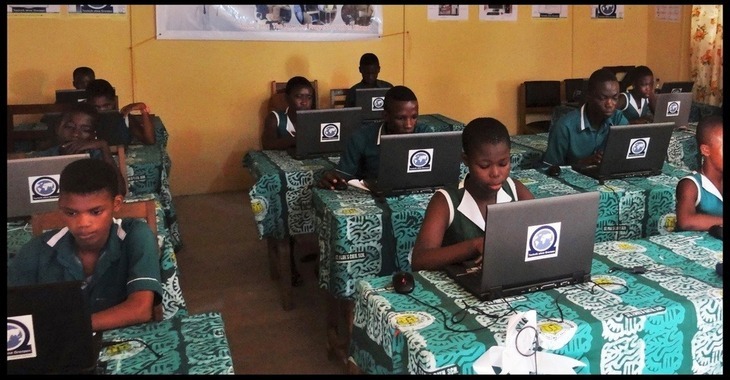 This sustainable activities includes: repair of all the faulty laptops, run a practical computer lesson for all primary and Junior High school students of the village of Agona Abodom and Nkanfoa in the Central Region of Ghana. Who benefits from this? The pupils and teachers of a total of four schools (about 2500 pupils and 68 teachers) And how is that sustainable? After repairing all the faulty computers, the teachers will be trained in the basics of computers in a four-week workshop, before passing on their knowledge to the next generation of students. At the same time, the schools are equipped with computer rooms, so that a maximum of two students work together on one computer. Teaching Computer Basics (TCB) is a project of the regional groups Cape Coast and Erlangen and of Technology without Borders (TeoG). It has already been implemented, in 2015 in Cape Coast, Ghana and at the end of 2015 / beginning of 2016 in Lushoto, Tanzanian (www.blogs.fau.de/teogtcbtansania), end of 2016 in Agona Abodom in the central region of Ghana and early in October 2017 it was implemented in collaboration with SADA In Lome, Togo (www.tcbghana.org). With TCB, we want to enable schools to put the computer lesson in the curriculum into practice so that students no longer have to learn from a book what a mouse click is. For this, we first equip a room with computers and the Internet. Afterwards, the teachers are taught the basics of the office, Internet (including security) and the construction of computers in daily workshops. What's new? We want to use the wealth of experience that we have built up through the last projects. This includes a technically better computer room and training to clean computers and computer rooms, so that the computers still work on site for several years and do not migrate to electronic waste due to too much dust and therefore heat. When does it start? The project will be implemented on site between March and April 2018. What do we achieve with TCB? Access to computers and the Internet will allow the students and teachers of Agona Abodom to leap into the modern world. Especially for the younger generation, this creates better career and training opportunities, which in turn can have a far-reaching impact on society. In addition, the teachers benefit from the opportunity to create their lessons with up-to-date information and thus can broaden their horizons, as well as that of the students. What is needed? 1. New or Used Laptops which are in good conditions. 2. Logistical cost of workshops in Nkanfoa and Agona Abodom of the Central Region. 3. Laptop batteries and chargers How can you contribute to this project? With your donation you help us equip the computer rooms in Agona Abodom and make a practical computer lesson come true. Depending on which area you would like to donate, you can help us with the purchase of devices such as the batteries or others. We look forward to every helper and say at this point ever a huge thank you!